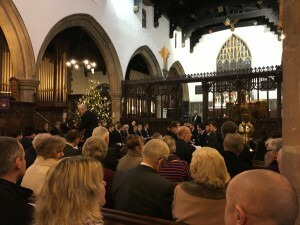 The following is read out each year at the Founder’s Day service to remember the foundation of Ermysted’s and its chief benefactors over the years. Before the year 1492, Peter Toller, rector of a mediety of the living of Linton-in Craven and Dean of Craven, founded in the Parish Church of Skipton the Chantry of Saint Nicholas, to which was attached a Grammar School for the children of the town. In the year 1492, the Founder in his will left to the Chantry all his lands and tenements in Skipton, Addingham, Eastby, Draughton and Hellifield, together with a sum of money for ornaments and repairs. In the year 1548 the Chantry of St Nicholas was dissolved and its lands were appropriated. It was nevertheless agreed by the Crown that the revenues of the School should be continued. On September 1st, 1548, William Ermysted, Master of the Temple and Canon residentiary of St. Paul’s Cathedral in London endowed the School with further revenues from lands situated in Skipton, Addingham and Eastby, and acquired for the housing of the school the Chapel of St. James, late of the Knights Hospitaller of St. John, which Chapel he had purchased from Henry, Earl of Cumberland. In this building the school remained until its removal in 1876 to the present site. The opening words of Ermysted’s Foundation Deed express the purpose he had in mind. In the year 1707 William Petyt, a former Scholar of the School, bequeathed a sum of £200 towards the maintenance of Scholars of Christ’s College, Cambridge, for such members of the College who had been Scholars of the Free Grammar School of Skipton-in-Craven. In addition, a further sum of £50 was bequeathed by him for the benefit of the School, which money was subsequently devoted to the purchasing of Books for poor Scholars. About the year 1707 Sylvester Petyt, brother of William Petyt, and also a former Scholar of the School, presented to the School a valuable collection of books. In the year 1719 Sylvester Petyt left money to the Masters and Fellows of Christ’s college, Cambridge, “for an augmentation of the maintenance of such Scholars who have been of the Grammar School, Skipton”. In the year 1913 a sum of £1000 was given by friends of the School for the purpose of improving the Playing Field. In 1920, the School Library was built as a memorial to Old Boys who fell during the Great War. The cost of this was borne by Old Boys of the School. In 1937 a Scholarship Fund was opened. Contributors were generous friends, Old Boys, and the School Dramatic Society. A sum of £4,000 was subscribed and, in 1939, the Hartley MacIntosh Scholarship came into being. In 1939, Mr J W Emmott, of Burnley, set aside a trust fund bearing an annual interest of £200, this sum to be devoted to Scholarships at the Universities of Oxford or Cambridge for pupils of this School and of the Girls’ High School. In 1946, an appeal was made to provide a worthy Memorial to the Old Boys of the School who lost their lives in the war of 1939-45, and numerous Old Boys, Governors, pupils, parents, members of the Staff and many other valued friends of the School generously contributed upwards of £17,000 towards the cost of the Memorial Hall, the Organ, and the alterations to Big School, the Coulthurst Trust payment for the Organ outright when the Hall was opened in 1959. In 1964 Mr Llewellyn Skerm, a former Master at the School, in his will bequeathed the sum of £5000 which was added to the general endowments of the School. And in 1969 in accordance with the will of Mr Herbert Sewell-Lord, of Perth, and following the death of Mrs Lord, the Trustees of his estate also gave £5,000 to the School. To commemorate the quin-centenary of Peter Toller’s death a sports Hall was erected between the School and the cricket pitch. The Sports Hall was opened on Speech Day 1994 by Sir Peter Yarrington, Chairman of the Sports Council. £350,000 was raised towards the cost of this venture through the generosity of pupils, teachers, parents, Old Boys, Governors and friends of the School, the balance of the cost being met from Foundation Funds. In 1996, Mr David Heap of Kendal left in his will a legacy of £36,690 for the general benefit of the School but preferably for the furtherance of outdoor pursuits or a travel scholarship. In 1997 Mr Ronald Jackson Windle of Gargrave left in his will a legacy of £25,000, to be added to the general endowments of the School and in the same year an anonymous benefactor in his will endowed the School with the sum of £110,000. The donation of £40,000 from the Wolfson Foundation in 2002 and again in 2010 provided assistance with the refurbishment of our Science laboratories. And in 2003 a successful bid for new Technology facilities brought a further £1.3 million and allowed the building of 8 new classrooms. A grant from the Department for Education for £1.75 million resulted in the building of the new Refectory in 2007 and in the same year an additional science laboratory was erected as a result of a generous gift from Skipton Building Society and local supporters. In November 2010, the late Mr Myles Birkett Atkinson, an Old Boy of the School, bequeathed, in his will, the sum of £48,000. These are the chief, but not the only benefactors of our Ancient School. Many have shown their regard for it by gifts, and likewise by service, recorded and remembered with gratitude. ‘The memory of the just shall remain for ever, and he shall not be afraid of any evil tidings’.